If you're looking for some seriously challenging road cycling, then this is definitely the ride for you! This tour will take you to the tallest and toughest peaks Thailand has to offer on spectacular, winding roads that provide tough-but-rewarding climbs and exciting descents. Comprised of towering mountains with densely forested slopes, Thailand's northern provinces are known for their stunning scenery and varied ethnic hill tribes who live in remote villages. Starting in Chiang Rai, we cycle south to the capital of the Lanna Kingdom, Chiang Mai, where we tackle some tough climbs before starting the truly serious ascents. Riding through the picturesque Pai Valley and the riverside town of Mae Sariang, we are on the infamous Mae Hong Son Loop with the ultimate finish, riding to the summit of Doi Inthanon, Thailand's highest mountain. Arrive in Chiang Rai. We'll then meet up for trip briefing and a welcome dinner. We start our tour with a gentle warm-up ride through a fairly flat countryside of Chiang Rai. We leave Chaing Rai and head south to our tranquil resort nestled in a valley. The terrain starts out flat but then begins to undulate as we skirt Doi Luang National Park. 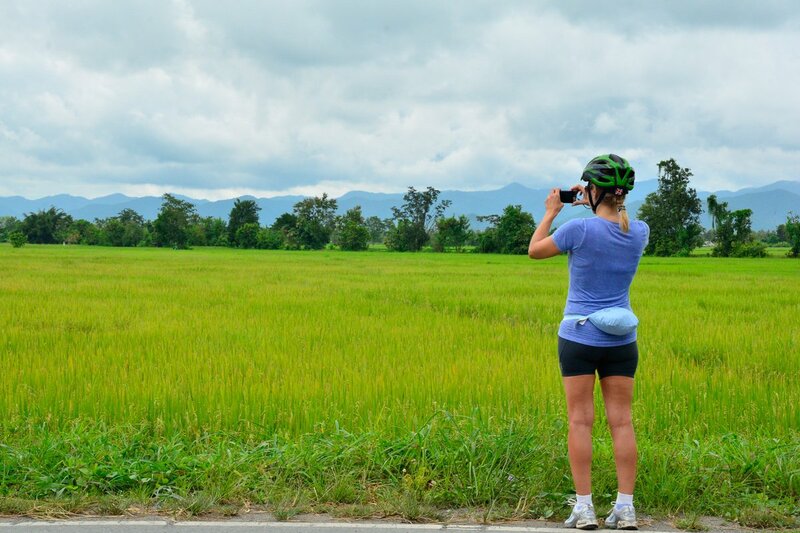 We cycle to the former capital of the Lanna Kingdom, Chiang Mai. We start out nice and easy but then we have a short climb before flying back down to the flats on the way to our riverside hotel. Today is a semi rest day. Head out early for the unrelenting 13-km climb to Doi Suthep to visit the famous temple and enjoy panoramic views of Chiang Mai. The afternoon is free to explore the city on your own. We circumvent imposing Doi Suthep to the peaceful district of Samoeng. Our ride out of Chiang Mai is flat, but soon we start climbing. We ascend over 2,000 m and descend about the same amount. Our ride starts nice and flat through rice fields before we climb up a scenic winding road. Then it’s a thrilling 20-km overall downhill to Pai Valley. We leave the tranquil Pai behind as we climb up to Mae Hong Son. When we reach 1,443-m, it's time to take a break and enjoy the view before we descend through mountain villages. It's an easier day in terms of kilometres ridden but there are still some hills to tackle. Now in hilltribe country so close to the Burma you will notice a Burmese influence. We descend more than we ascend, but with enough climbing to test our legs. Our toughest day challenges us with a 20-km climb of 860 m to the pass at 1,210 m (4,030 ft.). The climbing continues before enjoying a 10 km descent. Climb to the top of Thailand! It's a tough start and the final 10 kms to the "Summit of Thailand", 2,565 m, will push you to the limits. Then head downhill to Chom Thong, where we transfer to Chiang Mai. Today enjoy a free morning. Day 2 - Chiang Rai - Warm-up Loop Ride 65km. +373m. A very tough and challenging ride. Really enjoyed the challenge. I have been on around 20 different cycling expeditions with Spice Roads and other companies. This was definitely the most challenging, rewarding and enjoyable of them all. Fantastic challenging route. Aum and Fam were the most professional, outstanding leaders you could wish to meet. Our guide, Noom, did an amazing job making sure every goal we had for our trip was met. He kept us safe, pointed out all sorts of local culture, taught us some language, kept us well fed with incredible Thai cuisine, gave excellent directions, and kept us smiling and happy every single mile of the trip. He made us enthusiastic about returning to Thailand to explore more! We couldn't have asked for or expected a better guide. The food choices were always well thought out paying attention to all of our diverse dietary needs. We got to try some incredible food! There was always plenty to eat including local specialties. The hotels were clean and comfortable in terrific locations. All around one of the best trips we've ever taken and we've been on at least ten. On this hilly, and in places steep, ride you will be challenged as you head up and over many beautiful passes and reach the Summit of Thailand at 2,595 m/8,511 ft. You will ride just over 1,000 km in 11 days on smooth tarmac roads. The trip is fully supported, and your guide’s expert knowledge of the area and terrain means that you always know what is coming up in terms of distance and difficulty. This makes a tremendous difference, as does the constant supply of cold drinks, ice, and fresh fruit. Suitability: This is a tour for cyclists possessing a high level of physical fitness. Fitness will be a huge asset on those long days and on the undulating hills. The tour is fully supported, and the bus is always close at hand for those that find the riding too difficult. Biking Conditions: We ride between 40 and 146 km a day for a total of 1,019 km in 11 riding days. Though the distances may not be that long, the climbs will be tough and challenging. The ascents range up to 2,900 m (9,500 ft) for a total of 17,721 m of climbing! The roads are 100% tarmac and in good condition. Upon arrival in Chiang Rai, we pick you up from the airport and transfer to the hotel. Assemble your bikes, and we take you out for a Thai dinner. A gentle introduction to cycling in northern Thailand as we try out the bikes on a flat ride through the countryside outside Chiang Rai. The vista of rice fields is intermittently interrupted by karst peaks that jut into the landscape. There will be one climb, but it is a short 2 km. In the evening, we have the option of going to the colourful night market. Riding from the hotel, we stop for a quick visit to the uniquely modern White Temple. We then have a relatively flat ride for 90 km as we skirt Doi Luang National Park. A section of this is on a main road, and we have the option of bypassing it by taking a lift in our support vehicle. Our main climb of the day will over 25 km long, and we will have ascended 800 m before we ride down to lush Phrao Valley. Here we overnight in traditional Lanna-style accommodation. A flat and fast course today with only one major hill as we ride through endless rice fields south to the former capital of the Lanna Kingdom, Chiang Mai. Once we have found the Ping River, we slow down our pace as we ride the small road that follows it downstream. We follow the Ping all the way to our riverside hotel. We have a semi rest day, but for those that want some climbing, we head out after breakfast to the top of nearby Doi Suthep. Once we pass the Chiang Mai Zoo, the unrelenting climb of 13 km begins. It should take just over an hour, and at the top, we climb some steps to visit the famous temple. Here we'll also have panoramic views of Chiang Mai. We then descend to the hotel, and the afternoon is free to explore the city on your own. We circumvent imposing Doi Suthep to the peaceful district of Samoeng. Our ride out of Chiang Mai is flat, but soon we start climbing. We have two gentle but steady climbs before taking a break in Samoeng. This area was the first settlement of the Lanna people, who were escaping from a Burmese conqueror in the 18th century. The climbs continue in the afternoon as we ride up to 1,140 m with a view-point before starting down to the Mae Sa River Valley. We pass orchid farms and other flower fields that are grown for the Chiang Mai mar-ket, as well as fields of vegetables cultivated by the Hmong. We climb up and over a mountain to get to the next valley. We as-cend over 2,000 m and descend about the same amount, so an equalising day lies ahead. Our ride starts nice and flat through rice fields before we start our ascent on a scenic winding road. The views of the mountains are superb as we ride to an altitude of 1,440 m. Then it’s a thrilling 20 km overall downhill, but with a few ascents thrown in to make the riding interesting, down to Pai. Our overnight is in a bou-tique hotel in the centre of town. We leave the tranquil valley of Pai behind, and after 10 km, our first climb begins. When we reach 1,443 m, it's time to take a break and enjoy the view before we descend through mountain villages. There are of course a few more climbs to come, but they will seem like undulating hills. We end our ride at Mae Hong Son, a town nestled in between mountains populated by Shan whose ancestors came from the Shan region in Burma. The hilltribes of the region consist of Karen, Lisu, Mhong, Lahu, and Lua, and each have their own distinct culture. Enjoy the natural surroundings and the pool to give your legs a rest from pedalling. Today is an easier day in terms of kilometres ridden, but there are still some hills to get over. We are now in hilltribe country, and being so close to the border with Burma, you will no doubt notice a Burmese in-fluence on the architecture. The day will end with an uphill ride to the small traditional village of Khun Yuam. We descend more than we ascend, but there is still enough climbing to test those legs. We ride past farms, orchards, forests and will always have mountains as our backdrop. This scenic road will take us directly to quaint Mae Sariang and our riverside hotel. Our toughest day awaits, though tomorrow will rival it with steepness. A brutal start with a 20 km climb of 860 m up to the top of the pass at 1,210 m (4,030 ft.). The climbing continues as we cross through beautiful mountains and jungle landscapes, and we finally have a 10-km descent to enjoy. We'll pass the refugee camps where members of ethnic minorities of Burmese origin have come to escape their homeland. The sheer scale of the camps will astound you. But back to the climbing, as it hasn't ended yet, and a steep 500-m climb will have to be tackled at kilometre 95 before we finish at the town of Mae Chaem. The kilometres don't look long, but the gradients will be tough today as we climb to the top of Thailand. From Mae Cham, the ascent starts immediately, and for the first 15 km, we climb 870 m. The ride is shady and quite windy, providing some distraction from the burn in your legs. The final 10 km will be the true test, taking us to the "Summit of Thai-land" at 2,565 m. A photograph at the sign marking your accomplishment is a must. Then it's downhill, with a few more ups, to Chom Thon. Here we'll have a choice of getting in the van and transferring the flat section to Chiang Mai or riding for 65 km more to up today's total to 141 km. Tonight, it's time to celebrate your accomplishment! Enjoy a free morning taking in Chiang Mai or attempt Doi Suthep one more time! We have Trek Domane's and carbon Émonda's available for rent if you choose not to bring your own bicycles. These bicycles have Shimano components. If you have your own saddle that you are comfortable with, you are welcome to bring it and we'll fit it. You should consider bringing your clip pedals, shoes, and cleats. If you bring your own bike, please make sure it is a road bike in good mechanical order.